The Branchline Society are honoured to have been asked to assist GWR (the new franchise that succeeded FGW on 20 September) in running a very unusual and special charity railtour in aid of First Devon and Exeter Prostate Cancer Fund. The aim is to raise £20k for a portable scanner. Then Newton Abbot (through P1 requested), Totnes facing crossover at 222m 33ch to P2 (reverse) and via the mainline South Devon Railway connection to Buckfastleigh (11.15). Enjoy a break on the delightful South Devon Railway or this small market town with all its amenities and attractions. Given the length of a HST the front should be well beyond the end of the platform to clear the starting signal for return. There will be workshop tours and services operating on the SDR. 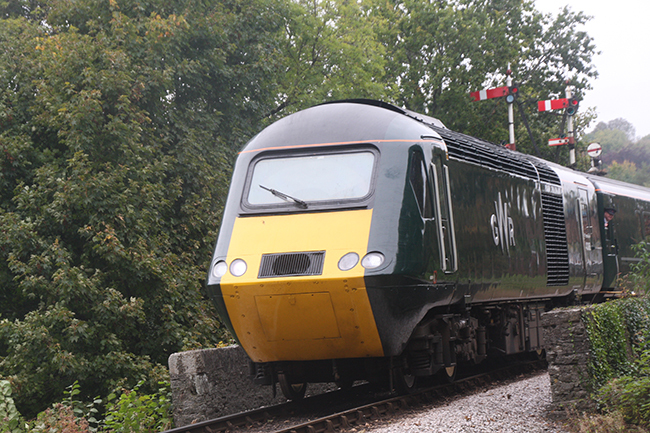 Departing at 11.25 the HST makes an extra optional return trip to Heathfield (12.44/12.55) also for local people, returning to Buckfastleigh at 14.47. It then picks up all the passengers from the main tour before departing at 15.02 to Heathfield again (16.22/16.42) then back to Paddington as per outward route. This might be the farewell railtour (and is the first HST) to the mothballed Heathfield branch which has had no booked traffic since the timber trains to Chirk were transferred to Exeter Riverside on 3 April 2015 (BLN 1233.914). A comprehensive catering service will be available on board including real ales and freshly cooked food from a Travelling Chef, with all proceeds going to charity. In order for local people to get to travel on the HST from Buckfastleigh the South Devon Railway’s Routemaster bus will run from Newton Abbot Railway Station ( dep 10.00 ) to Totnes Railway Station ( dep 10.30), arriving into Buckfastleigh at 10.50. The Routemaster ’bus will also be running a revised version of the Ashburton Rail Replacement Service between 11.20 and 14.40 . Standard class fares from London Paddington to Bristol Temple Meads stations £75 and £50 from Taunton or Exeter St. David’s. There is a Buckfastleigh to Buckfastleigh return special fare of £25 which will be donated to the South Devon Railway and the Devon Diesel Society. First class is not available and no child discounts. Cheques payee 'Branch Line Society'. PLEASE NOTE PAYMENT BY CARD IS NOT AVAILABLE ON THE MAIN LONDON CHARTER (enquire if you are not able to send a cheque). Provide your name, address, email and contact phone number. If no email supply an SAE, and a second if you require an initial acknowledgment. All bookings to our member Jill Everitt, 4 Barnside Way, Moulton, Cheshire CW9 8PT. Envelopes should be marked ‘HST Special’ Booking queries and general queries to NB: bookings will be acknowledged after 14 September.